Dried Roselle (hibiscus sabdariffa or grajiab daeng in Thai) is the dried hibiscus flower and is used to make nam grajiab in Thailand (see recipe below). This sour tasting tea is served sweetened over ice. 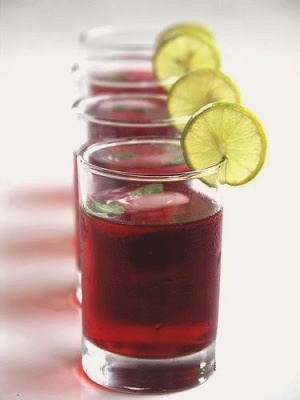 It is very refreshing on a hot day and its dark red color is appealing. Roselle is appreciated for it mild diurectic qualities and it is said to rejuvinate the body and mind. It is also said to lower blood pressure and it is high in calcuim. Hi where do you buy the roselle tea? Ntuc? yes, dried roselle flower can be bought either at sheng shiong or ntuc . it is a species of hibiscus. it is sold at about $2.50 – $300 per 200g pkt if i’m not wrong. tx for visiting. Most Chinese medicinal hall sell them. In Chinese, it is called "LUO SHEN HUA"